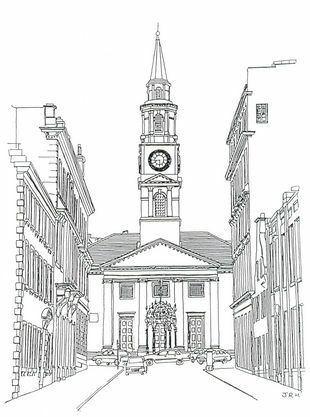 Known affectionately as ‘The Toon Kirk’, Wellpark Mid Kirk is home to a lively congregation which cherishes its building, a handsome classical church with an Ionic portico and steeple modelled on St Martin-in-the-Fields. The design for the faÃ§ade was supplied by Lord Cathcart (apparently obtained in Bristol), the designer of the body of the church was apparently James Ewing. The church was built in 1760, the steeple in 1787. The building was refurbished in 1878 and restored in 2000. The interior has galleries on three sides, a pipe organ of 1867 (fully restored 2008), stained glass windows, several memorials and marbles and the friendliest welcome.